All types of trades vans are a target for these unsavoury individuals. Take a look at the video below for an example of just how simple it can be for somebody with the know-how and inclination to break into your property while you are fast asleep. As you can see, a capable thief can gain access to your van in less than sixty seconds. This means that years of your hard work and investment can be wiped out in the time it takes you to boil a kettle – that hardly seems fair now, does it? The tool showcased in the video can be easily obtained online, marketed to professional locksmiths as a ‘skeleton key’ but just as likely to fall into the wrong hands due to a lack of any regulation – as many van owners have discovered, to their annoyance. These tools do not leave any visible signs of a break-in, which could cause headaches with insurance claims, but unfortunately, it doesn’t even take a technologically sound thief to break into a typical van. A more brutish and unsophisticated method involves two strong twists with a sturdy pair of pliers, which can be an even faster way of gaining access to your vehicle. Watch this video, uploaded by a tradesman in the aftermath of a burglary of his equipment, for an example. Deadlocks, which are fitted by a specialist and designed especially for the needs of your van. A deadlock can only be operated by the vehicle’s driver, and apply a separate bolt to any doors to provide a welcome extra layer of security. 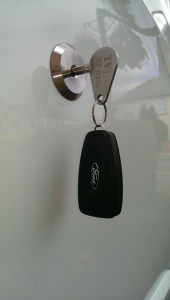 Slam Locks, which automatically secure and lock up a vehicle from the moment the driver’s door is closed – a welcome and hugely convenient method of keeping your valuables safe if you exit your van with your arms laden with equipment for the job ahead of you. Slam locks also come with a unique appearance, meaning that much like the Hykee RepLock, they provide a visual deterrent at a glance. OBD Blockers, which prevents a thief that has gained access to your van driving away with it. Much like the previously-profiled skeleton keys, which are aimed at locksmiths but frequently commandeered by thieves, On Board Diagnostics (OBD) Units were built for mechanics and car dealers to discover issues with a vehicle but have found a second life in the hands of criminals. Having gained access to a vehicle, thieves use an OBD to trick the van into thinking that the key they are using is for the ignition, leaving them able to drive away with your vehicle. An OBD Blocker will disable this feature of your van, leaving a thief with a useless gadget that will not be activated. However, we particularly recommend a replacement lock for your van known as the Hykee RepLock, which greatly enhances security and allows you leave your vehicle unattended at night. Growing in popularity each and every day, Hykee RepLock’s leave vehicle owners safe and content in the knowledge that opportunistic thieves will not be able to empty their contents. Installed and fitted in less than 30 minutes, with no risk of damage to your paintwork thanks to a complete absence of drilling or adjustment, the Hykee RepLock replaces the traditional – and comparatively ineffective – locks on your van. 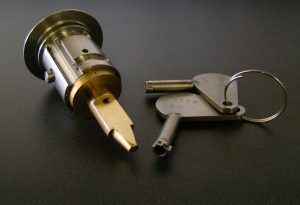 Designed especially for use with the popular Ford Transit, Custom and Connect models (although also available for use on any commercial Ford vehicle), the cylinder contained within a Hykee RepLock cannot be picked or drilled through, instantly offering a whole new layer of protection for your valuables. You can see a Hykee RepLock in action by viewing this video, uploaded to YouTube by a user that was delighted with their investment. As you will see, the Hykee RepLock is also aesthetically different to a traditional lock to the naked eye, which ensures that any patrolling thieves will be aware that they have been defeated before they even attempt to break into your van. Prevention is always better than cure, and this visual deterrent will be a huge boon to your confidence. What’s more, a Hykee RepLock ensures that access to your vehicle comes from a different source to the ignition, which adds a further later of security should you misplace on or both of these keys. You would not leave your house unlocked at night, so why would you take such a chance with your van? Crime statistics that detail theft from vans and vehicles are steadily growing, and failing to take the appropriate precautions leaves you at risk of joining this list of victims. With the aid of KG Key Services and the Hykee RepLock, however, you can be assured that any aspiring thief will fail in their attempts at breaking into your property, and your business remains safe from such unwanted attentions. Make the change to a fitted Hykee Lock today, and you will enjoy a considerably safer tomorrow – as always, you can call our Edinburgh team on 0131 660 2924 or Glasgow team on 0141 208 2924 to discuss your security needs in detail or for quotes on price, availability and compatibility.